Didn’t live up to this Janeite’s expectations. This was such a mixed bag of a reading experience. Honestly, though, I figured it might be. I’ve read a couple of Shannon Hale’s adult novels before this, and neither of them worked for me. And the Goodreads average rating for this book is not great. But I was still hoping! Especially considering the premise. It wasn’t one of those ‘meh’ reads, either. One second I would be actively hating what was going on, irritated with the main character, the next, something adorable would happen and I would be happy again. I have three main complaints: 1) The main character, 2) the wasting of the premise, and 3) the tone. Let’s start with the premise, though, so you’ll know what I’m talking about. Our main character is Jane, and her eccentric and very wealthy great aunt (or something) has left her one bequest in her will: a three week stay at a secretive (and expensive) place called Austenland. She does this because she has stumbled upon Jane’s secret, which is that she has abandoned dating for a relationship with Mr. Darcy, basically. (The aunt found Jane’s copy of the Colin Firth P&P stashed in a potted plant.) The idea, supposedly, is that Jane get Austen out of her system, though how going to a place and immersing yourself in Austen for three weeks is meant to do that escapes me. She wants to get her niece out of her fantasy world by pushing her further into it? Anyway, so Jane heads off to England, not even the least bit grateful or excited about it. And when she gets there, she’s immediately turned off by the whole endeavor. She dislikes the woman whose job it is to introduce her to the world (and who seems to be the owner?) and she refuses to give up her technology, hiding her cell phone when the woman isn’t looking. This irked me right away. If you’re going to bother going to a place like this, it’s probably a good idea to have a good attitude about it going in, which includes playing by the rules. She doesn’t. It seems Austenland is designed for immersive roleplay. You go in for three weeks and live like you’re in the Regency, with a fake name (and age, if you want, though props to Jane for not letting them change her age, which would have made her an unmarried spinster back then) and everything. And as Jane quickly learns, the clients of this place are all wealthy women looking for a little fake romance. Would you like a Wentworth? A Darcy? Even a Willoughby? But Jane isn’t like those other women, those shallow, rich women. She’s DIFFERENT. And you definitely know that, being inside her head. All of my complaints really tie together. Part of the reason I feel the premise is wasted is that Jane is so full of contempt for the whole endeavor, especially at the beginning. She dismisses the other clients, and at first doesn’t even want to participate at all, instead sneaking off to the employee housing and making out with a gardener named Martin who she catches watching basketball. She’s better by the end, but at the beginning I found it a bit unpleasant being in her head. It doesn’t help that the whole tone of the novel is like that, just weirdly cynical and negative, when I wanted something light and fun, maybe poking some fun. There’s poking here, but I wouldn’t really call it “fun”. 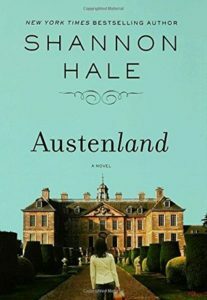 The bitterness does lighten up towards the end when Jane starts participating in Austenland and making some actual human connections. The last chapter was really good, though, I won’t lie. There was some swooning. I enjoyed it; I’m not a monster. All in all, some bad, some bad, equally on both sides of the scale. I will probably check out the movie, because I love Keri Russell. Share the post "Didn’t live up to this Janeite’s expectations."